If you have a family, you know how expensive taking them out can be. We’re here to change that with our new Big Boy 3 Game Pack! 3 is the right number of games for a lot of families and it includes meals at Big Boy for an added treat. One Bleacher Seat with a Bleacher Back for 3 games. We understand how uncomfortable sitting in the bleachers for 9 innings can be. With your Big Boy 3 Game Pack you’ll receive a bleacher back with your seat for all 3 games in your package. Larks Hat. We can’t have you attend a Larks game without any gear. 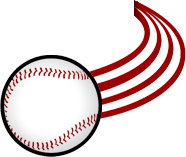 You’ll receive a free Larks Hat with each package purchased. 3 of our Best Games of the Summer. Our Scheels 7 Game pack is currently 97% sold out. This will be the only way to guarantee a seat to the best games this summer with a bleacher back rest. 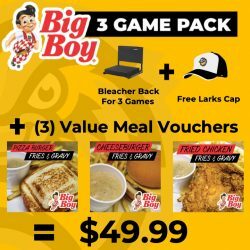 Have a question about the Big Boy 3 Game Pack? Text “Bigboy” to 701-557-7600 and a member of our team will reach out to assist you.